Description: This patient wanted to feel comfortable wearing short sleeves and did not want to feel weighed down by excess tissue. This photo is about 3 weeks after arm lift surgery (brachioplasty), she was thrilled with the results and glad she had it done. 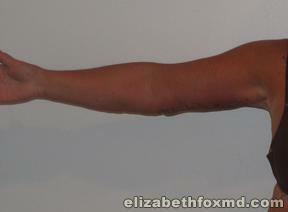 Contact Dr. Elizabeth Fox for more information on arm lift surgery and arm lift cost. Web Design by PracticeDock, © © Elizabeth Fox, MD. , All rights reserved. © Copyright Fox Plastic Surgery Center, All rights reserved.